I hadn’t been to the Oregon Trail Ruts since I was about 16 and I had actually forgotten what they looked like. And I had also forgotten how deep those ruts were as well. It’s impressive to see how deep they really are but it brings home to a person how arduous they’re trip was. Their trip was brutally exhausting , their loads heavy. You can see this by how deep the ruts cut into the rock from the wagon wheels. Just think of it! Wagon after wagon filled with all that they owned being pulled by oxen, followed by more wagons after wagons,. And all this going on for decades after decades…..Almost 160 years later the ruts can be seen today as a testimonial to their bravery and determination to start a new life more than half way across the continent. Few of us today would have that same brand of courage. The history of the Oregon Trail Ruts is a fascinating one to me whenever I look at the deeply cut ruts in the soft rock and soil of the Guernsey earth. Today, you can view the small town from the banks of the Platte River as you drive out to the ruts just a scant mile out of town. It’s hard to picture, when you stand at the top of the hill, viewing the Oregon Trail marker sign ruts, what hardships these people must have actually faced. When you see the comforts of a town just a few moments away, it is indeed hard to picture. Originally, in the early 1840’s, when the move west was just beginning, the Oregon trail carried hundreds of thousands of people who were unable to pay for the expensive passage rates. As well, many of them wanted to bring along with them their furniture and equipment that they planned on using to start businesses. much of which was not feasible to transport because of cost. For that reason, many chose to travel across the prairies to their destionation. So, the fascinating Oregon Trail became the ‘highway’ transport for over 20 years and extended into the late 1860’s. With the advent of completion from the Union Pacific railroad route in 1869, the new method of transport, everything changed.. You can see their trail on the map from a photo I took in Guernsey. Some of the ruts remain, a testament to the huge number of oncoming settlers determined to make this difficult trip. 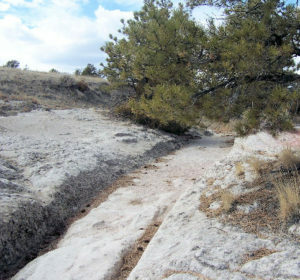 The deep ruts cut into the rocks still remain after over a century later. Some of the ruts wore down into the rock anywhere from 2 to even 6 feet deep! 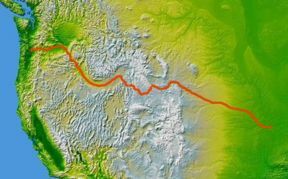 As their trail passed further and further west, the wagon trains were of necessity, forced to follow close behind each other creating the resultant ruts which today show so deep. I believe this area is considered some of the more impressive places along the Oregon Trail that show the path the settlers took and gave a hint of some of the challenges that the emigrants would have to face as they continued west. If you are planning a trip out west, please take the time to visit register Cliff and the Oregon Trail Ruts in Guernsey Wyoming. They are worth your time and is a wonderful close up peek at the history that helped make tand create the west. Visit our Period Correct Bonnet page (Bonnets made with polyester/cotton material using prints similar to what was worn during the 1800's period) to see some bonnets made of period correct style material.